The Wind-up Fetal Doppler is a device to easily and accurately count the fetal heart rate while the mother is in labor. JOHANNESBURG, South-Africa - Royal Philips (AEX: PHIA, NYSE: PHG), today announced a partnership with South Africa based not-for-profit organization, PET (PowerFree Education Technology), to further develop, test and commercialize a Wind-up Doppler Ultrasound Fetal Heart Rate Monitor (in short: Wind-up Fetal Doppler), a unique power-independent clinical innovation aimed at addressing the high rates of preventable infant mortality across Africa. 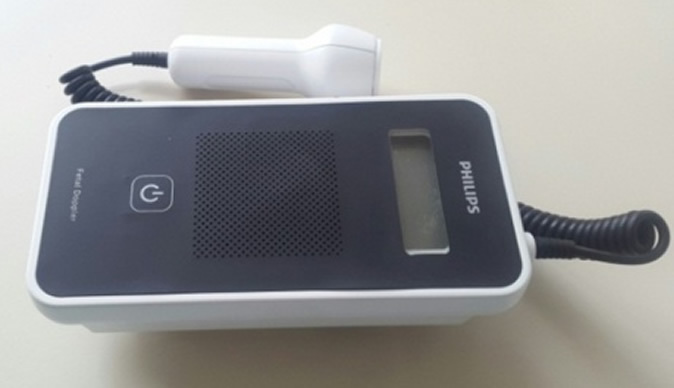 The Wind-up Fetal Doppler will be commercialized by the Philips Africa Innovation Hub (http://goo.gl/M1xVBI), which is the center for developing innovations "in Africa-for Africa" in the areas of healthcare, lighting and healthy living. The Philips Africa Innovation Hub has unveiled the first Philips prototype of the Wind-up Fetal Doppler, underpinning their commitment to the partnership. The prototype is subject to clinical testing and regulatory approval, before release for general usage. Women and infants in semi-urban and rural areas across Africa often die due to preventable complications during child birth. Many infants, especially in under-resourced settings die during labor or suffer brain injury due to an inadequate supply of oxygen to the baby during the hours that the mother is in labor. Many of these deaths could be prevented and cases of brain injury avoided, using a Doppler ultrasound monitor that helps midwives and delivering nurses to monitor the baby's wellbeing during labor(1). "It is very hard to do an accurate measurement with a Pinard-stethoscope, because you need to be able to hear the fetal heart well and count the rate correctly. It is often also uncomfortable for the mother. A Doppler ultrasound fetal heart rate monitor is a good solution, but the current monitors on the market require mains or battery power, and are not robust enough." states, Anneke Jagau (http://pet.org.za/about.php?view=3), a midwife working for PET. PET has been working on the development of the hand cranked, Wind-up Fetal Doppler for many years, and they verified the positive impact of the device in tests in Uganda (http://www.pet.org.za/media.php?node=11), where 60% more cases of abnormal fetal heart rate were detected in labor, compared to the standard Pinard-stethoscope. Maarten van Herpen, Head of the Philips Africa Innovation Hub, states: "Philips is open to collaborations with key stakeholders, including governments and NGOs, to create impactful innovations that matter to people and address the key challenges that confront society. PET has invested many years in the development of this important idea. I am honored that PET has chosen Philips as the company that is best positioned to commercialize it and make it available across Africa". "We are very excited about the collaboration with Philips", said Dr Francois Bonnici, Director of PET and Director of the Bertha Centre for Social Innovation at the University of Cape Town, "We chose to work with Philips because of a strong alignment on the mission to improve people's lives with meaningful innovation. As a market leader in healthcare, Philips will be able to make our innovation available and affordable for frontline health care workers across the African continent." Philips remains consistently committed to reducing child mortality and improving maternal health, linked to the current UN Millennium Development Goals 4 and 5 (MDGs); the company has also made a pledge to UN Secretary-General Ban Ki-Moon's initiative Every Woman Every Child and committed to improving the lives of 100 million women and children by 2025 targeting sub-Saharan Africa where high maternal and infant mortality can be addressed through early diagnosis and preventative care.